Tips to manage this itchy problem! 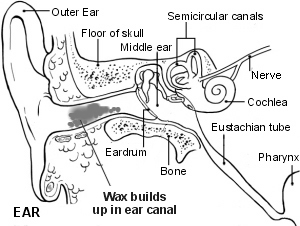 A doctor can look into the ear canal and confirm a plug of earwax has formed. A plug of earwax is not a serious problem, more a nuisance. You only need to remove earwax if it is causing symptoms such as dulled hearing. Earwax may also need to be removed for fitting of a hearing aid, or if a doctor or nurse needs to examine your eardrum. Ear drops alone will often help clear a plug of earwax. For example, olive oil, almond oil, sodium bicarbonate, and sodium chloride ear drops are commonly used for this purpose. Pour a few drops into the affected ear. Lie with the affected ear uppermost when putting in drops. Stay like this for 2-3 minutes to allow the drops to soak into the earwax. The earwax is softened and it often breaks up if you put drops in 2-3 times a day for 3-7 days. Flakes or crusts of earwax often fall out bit by bit. You may not notice the wax as it comes out of your ear. Ear irrigation is usually painless. Lukewarm water is squirted into the ear canal. This is usually done by a syringe to squirt water at the right pressure. This dislodges the softened plug which then falls out with the water. If ear irrigation does not work, or is not advised, you may be referred for Ear Micro-suction to remove the troublesome wax. Ear micro-suction may be performed by a Ear, Nose & Throat specialist or a trained GP. It requires utilizing a suction device to remove the wax under direct magnified vision. It is painless and has less associated risks compared to ear syringing when performed properly. Dr Jack Lee at Katong Family Clinic is trained to performed ear micro-suction and an appointment can be made to consult him for the procedure. Some people are troubled by repeated build-up of earwax and require ear wax removal every so often. In this situation, to prevent earwax building up and forming a plug, some doctors recommend using ear drops regularly - for example, olive oil ear drops. You may also wish to consult your local GP for advice and follow up.